The Yuba County Water Agency (YCWA) and other water management entities within Yuba County have prepared the Yuba County Integrated Regional Water Management Plan (IRWM Plan). To ensure stakeholder involvement throughout the process, local water managers formed a stakeholder group called the Regional Water Management Group (RWMG). The RWMG prepared a public review draft, provided a public comment period, considered public comment, and adopted the IRWM Plan. The YCWA Board of Directors, in coordination with the RWMG, held a public hearing to consider public comment and subsequently adopted the Plan. The Yuba County IRWM Plan addresses issues related to surface and groundwater, flood protection and management, water conservation and recycling, measures to protect groundwater resources, conjunctive management of surface and groundwater resources, water quality, recreation, environmental enhancement and other applicable water management strategies. The primary objective of the IRWM Plan is to develop and integrate these strategies to optimize water resources management and flood protection and management in Yuba County. To learn more about the Yuba IRWM group, please download the document posted at this link. The geographic extent of the Yuba County IRWM Plan encompasses all of Yuba County, which extends from the Sacramento Valley floor to the foothill and mountainous areas of the Sierra Nevada. The water management issues of the valley floor are common to other areas in the Sacramento Valley, and, to a large degree, differ from the foothill and mountain area issues within Yuba County. While these areas have some differing water management issues, they are linked by their shared use of resources, including access to the surface water resources of the Yuba, Feather, and Bear Rivers and their tributaries. The Plan Area is divided into the valley floor area of the County (which coincides with the boundaries of the County’s two groundwater basins described above) and the foothill and mountain area, which is located east of the valley floor area. To address water management strategies associated with urban wastewater treatment and wastewater recycling, the Plan Area has been expanded west of the Feather River to include Yuba City (which is located in Sutter County). The valley floor portion of Yuba County is bordered on three sides by watercourses (Honcut Creek, Feather River, and the Bear River) and bisected by the Yuba River. The common water management issues of this area include frequent flooding, wastewater discharge, urban growth, agricultural water supply reliability, minimum instream flow requirements, and the resulting conversion of agricultural lands to residential areas. The valley floor area also covers the Yuba County alluvial groundwater basins. The water purveyors on the valley floor currently use both surface water and groundwater to meet demand. YCWA delivers surface water to its Member Units from the Yuba River. In addition, the Member Units use their own water rights or pump groundwater to meet part of their water demands. Rural and domestic water users depend upon the groundwater basin for water supply. Protection of groundwater resources and supplies is an important issue. The municipal water purveyors located in the valley floor rely exclusively on groundwater to meet their needs. The municipal purveyors are California Water Service for the City of Marysville, LCWD, the City of Wheatland, OPUD, and Beale Air Force Base (AFB). The foothill and mountain areas of Yuba County include the North Yuba, Middle Yuba, and South Yuba Rivers, and a portion of the Feather River. 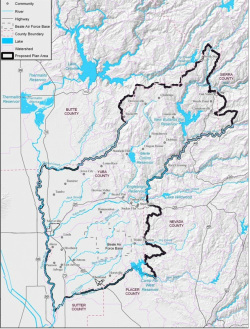 Portions of the Yuba River watershed extend east beyond the boundaries of Yuba County. The foothill and mountain area is underlain by the granite bedrock of the Sierra Nevada and has little access to dependable groundwater supplies. As a result, much of the developed urban and agricultural areas rely on surface water. Some of the rural and domestic water users depend upon groundwater from the joint and fracture system in the granitic bedrock for water supply. Water supply reliability is the primary water management issue for these areas because of the limited groundwater availability and limited access to surface water resources. Cities within Yuba County include the City of Marysville and the City of Wheatland. Urban populations are also located in the unincorporated communities of Linda and Olivehurst. Numerous other communities on the valley floor and foothill/mountain areas can benefit from a county-wide IRWM Plan and implementation of water resources management improvements. The solutions to these challenges will come from coordination between Yuba County land and water management agencies and stakeholders, and from an integrated approach within the county. The wastewater discharge water quality issue brings Yuba City of Sutter County into the planning process and provides the opportunity to reduce the potable water demand in the Yuba-Sutter region and reduce wastewater discharges to the Feather River or the groundwater basins.